Machinist tools are used to cut and shape metals and other materials. They are designed to accommodate various detachable cutting tools that can be selected to suit particular tasks. After a period of use and wear, these detachable tools can be replaced or even resharpened. These tools usually cut or peel material from a workpiece in the form of continuous ribbons or small chips. Machinist tools, also known as machine tools, are sometimes classified as light duty, medium duty, or heavy duty, based on their weight. Whatever the duty classification of a tool, it may be classified further as a general purpose or special purpose machine tool. General-purpose machinist tools can be used for many types of operations, on various size workpieces; special-purpose machinist tools are designed for specific operations on workpieces of certain sizes and shapes. 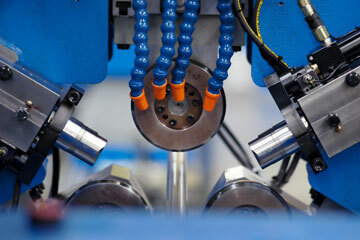 Machinist tools are designed to be either fully automated, semi-automatic, or manual. Their material cutting motions further define their capabilities. Rotary cutting machines rotate either the workpiece, the cutting tool, or both. Move specifically, turning lathes, capstans, and turrets rotate their workpieces, while drills, milling cutters, and grinding wheels rotate their cutting tools. Cylindrical grinders rotate both the workpiece and the cutting tool. Linear cutting machines remove material by moving either the tool or the workpiece in a straight line. More specifically, shaping and slotting machines move their tools, while planes and surface grinders move their workpieces. Good quality machinist tools enable work to be done efficiently, precisely, and safely. A machinist tool should also be reliable and have convenient operator controls. This machine tool vendor directory lists machinist tool solution providers throughout the USA.